Bereaved relatives of the July 7 bombings had their phones hacked by journalists at the News of the World, police believe. 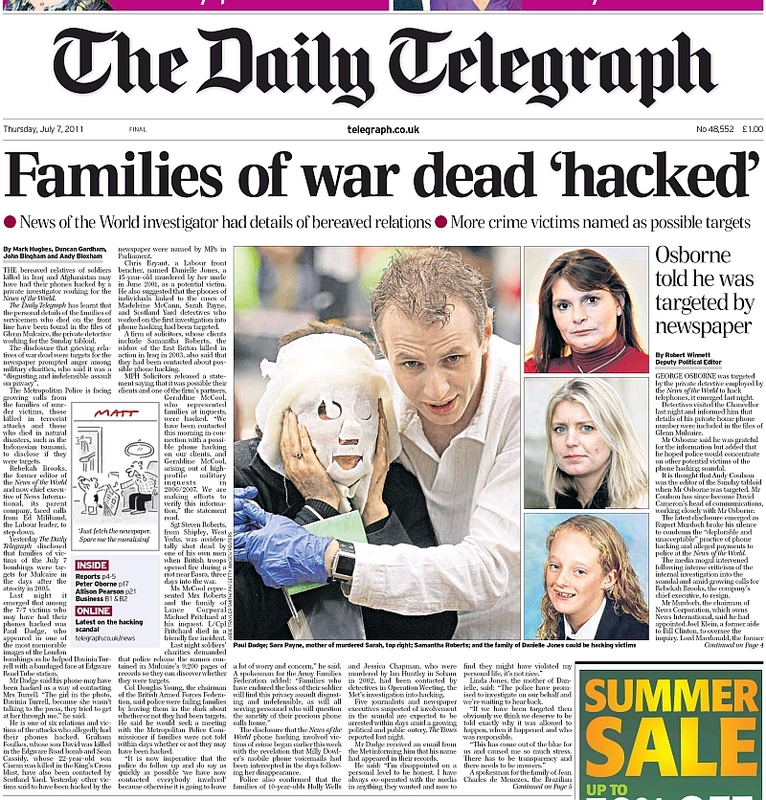 Detectives from Scotland Yard’s team investigating the phone hacking scandal are in the process of contacting a “handful” of the 52 bereaved families whose names or phone numbers have appeared as part of their inquiry, sources told the Daily Telegraph. It is thought that journalists were seeking to access voice messages left on family members’ phones as they desperately waited for information about their loved ones in the aftermath of the bombings in 2005. It is unclear if they were aware at that stage that their relatives had died in the bombings. The news will come as a deep shock to the relatives affected, coming as it does on the eve of the sixth anniversary of the bombings. A spokesman for the Metropolitan Police refused to comment on the continuing investigation. ..The disclosure that the News of the World phone hacking allegations involved the victims of crime as well as high-profile celebrities raised the possibility that other victims’ families were hacked — something police were examining. "Basically every major crime story, every major news event, there was some sort of hacking involved," said a senior police source. "It was systematic." Exclusive: the man at the centre of the phone hacking inquiry is filmed by a Dispatches team for Channel 4 News talking candidly about his work for the News of the World. Confronted on his own doorstep by a woman whose private details he obtained and released to the press, Mulcaire was recorded by a hidden camera. Asked "Who might have been the person who asked you to do it? ", he responds "I can't answer that because again it was by committee." His lawyer later emphasised that Mulcaire was using the phrase to mean more than one individual, not a formal committee set up to manage him. The revelation that more than one person directed his activity is significant because the News of the World insisted for many years that the commissioning of voicemail hacking had been the work of a single rogue journalist, the paper's former royal editor Clive Goodman. Mulcaire was jailed in 2007 along with Goodman for intercepting voicemail messages of the Royal family, as our home affairs correspondent explains in this special report. This whole thing is a move to further regulate the press, aka the alternative media. Would people be bothered about the hacking of the girls phone if the press had found some serious truth over the actual trial and sentence of the chap who carried out the deed? The same with the Soam murders, if the press had found something other than what had been offered as fact by the police, then the hackers would be the hero's. "if you ain't doing anything wrong then what have you to worry about"
I could not care less if my phone got hacked, they would find nothing Intel haven't seen already, the same with the Internet, everything electronic communication is a wide open platform for Intelligence, so why are people getting excited about the press being able to find out what we need to know? While allowing the real enemy...Intel, an open line into everything we do? DESPERATE Rupert Murdoch yesterday flew to London to try to save his ­crumbling empire. He arrived in a cowboy-style hat to be hit by claims News of the World reporters hacked the phones of 9/11 victims. Murdoch held talks with News International chief executive Rebekah Brooks, amid fears nine staff and three cops may face jail. HIS media empire is crashing around him, he's just shut down a scandal-hit newspaper and his BSkyB bid is in tatters, but Rupert Murdoch still came out grinning yesterday. And this cosy picture of him giving his backing to smiling Rebekah Brooks will no doubt infuriate the 200 loyal staff at the defunct News of the World who were ­sacrificed while she clung to her job. After he spent time at News International's Wapping HQ in East London, 80-year-old Mr Murdoch held crisis talks with Mrs Brooks, 43 - who denies any knowledge of the Milly phone tapping - at his home in Mayfair. The pair chatted behind closed doors as a former New York cop made the 9/11 hacking claim. He alleged he was contacted by News of the World journalists who said they would pay him to retrieve the private phone records of the dead. Now working as a private ­investigator, the ex-officer claimed reporters wanted the victim's phone numbers and details of the calls they had made and received in the days leading up to the atrocity. A source said: 'This investigator is used by a lot of journalists in America and he recently told me that he was asked to hack into the 9/11 victims' private phone data. He said that the journalists asked him to access records showing the calls that had been made to and from the mobile phones belonging to the victims and their ­relatives. Is it possible that the News of the World is the scapegoat for hacking carried out by Intelligence to remove texts and perhaps conversation records from the phones of victims to ensure nothing that would contradict the cover script for 911, 77, the Soam murders, our dead soldiers and Millie Dowler? This would place the journalists exposed as carrying out the hacks as Intelligence operatives first, acting as Journalist's. The boundaries between the bad intelligence guys and the Murdoch empire seem pretty blurred. spread the attack on his supportes in the US Republican party via curbs which will be implemented against Fox News in the USA. This is a fratricidal war between bent politicians, the corrupt media and bent coppers. Good will eventually come of it as their relationships have been blown out into the open for all to see, without the helf of 'conspiracy theorists'. Cameron used to go horseriding with Rebeka Brooks now she has been arrested. A Police Commissioner has now just resinged as well. This is a fratricidal war between bent politicians, the corrupt media and bent coppers. Good will eventually come of it as their relationships have been blown out into the open for all to see, without the help of 'conspiracy theorists'. The Commons Culture, Media and Sport Committee has received a letter from James Murdoch in response to the summons served on both him and Rupert Murdoch earlier today. (but then again is George 'W' Bush, according to 'W' (and 'W' wouldn't lie to us all, again. surely! No one interested in commenting on my posts re Murdoch? (Though any true Christian, or follower of Christ, would not support any form of 'Defamation'; 'Though shalt not bear false witness....'). This appears in the Old Testament, and so should be believed and practised by Jews, as well as Christians. Also, I suspect, by Muslims. People don't want to get banned even though Nazism is predominately a so-called ptb Zionist (not Jewish) construct. 7:13 Howbeit no man spoke openly of him for fear of the Jews. 7:15 And the Jews marvelled, saying, How knoweth this man "Letters", having never been taught? 46:12. And before this, was the Book of Moses (Torah) as a guide and a mercy: and this Book CONFIRMS (it - the Torah) in the Arabic tongue; to warn the unjust, and as Good News to those who do right. 46:30. They said, "O our people! We have heard a Book revealed after Moses, confirming what came before it: it guides (men) to the Truth and to The Straight Way. 6:153. Verily, THIS is My Way, leading straight: follow it: follow not (other) ways: they will scatter you away from His (Great) Way: thus doth He command YOU, that ye may be righteous. 6:154. Moreover, We gave Moses the Book (Torah), COMPLETING (Our favour) to those who would do right, and explaining ALL things IN DETAIL,- and a GUIDE and a MERCY, that they might believe in the meeting with their Lord. 6:156. Lest YE should say: "The Book (Torah) was sent down to two Peoples before us, and for our part, we remained unacquainted with all that they learned by careful study:"
6:157. Or lest YE should say: "If the Book (Torah) had only been sent down to US, we should have FOLLOWED its guidance BETTER than they (Sura 32:23)." Now then hath come unto YOU a clear (Sign) from your Lord,- and a GUIDE and a MERCY: then who could do MORE WRONG than one who rejecteth "I AM"'s Signs (and Torah - Bible), and turneth away therefrom? In good time shall We requite those who turn away from Our Signs, with a dreadful penalty, for their turning away. Point being made is Murdoch likes to hide his Jewish ancestry and upbringing, and claims to be a 'Born Again Christian', and just 'happens' to belong to groups which include 'Lucky Larry' Silverstein, 'appens to be friends with Netanyahu, 'appens to belong to ADL and so on and so forth, and just 'appens' to plug the Zionist line for all he is worth. Now my understanding is that Orthodox Jews have no time for 'Christians', 'Born Again' or not. Obviously there are exceptions. Whilst the likes of Aaronovitch might class my posts as 'anti-Semitic', he can take a running jump, because our moderators have a little (or should I more accurately say, 'a lot more') sense. It is as clear as day to me. Very very few do follow it. Even "Though shalt not bear false witness" outsider. NEW YORK -- Relatives of 9/11 victims were headed to Washington on Wednesday to meet with Attorney General Eric Holder about allegations surrounding Britain's phone hacking scandal. According to a London tabloid's story based on unnamed sources, a former New York police officer who became a private investigator said he rejected requests by journalists from Rupert Murdoch's News of the World to retrieve private phone records of Sept. 11 victims. The U.S.-based parent company for Murdoch's News Corp. has called the report "anonymous speculation" with "no substantiation." Norman Siegel, an attorney representing some 9/11 victims' relatives, said the family members want to cooperate with the FBI and the Department of Justice "to determine if such hacking was attempted, and/or occurred." "We are going to the meeting with the attorney general to listen to what he can tell us about the investigation and to ascertain the scope, the goals and timetable of the inquiry," Siegel said. Retired New York Deputy Fire Chief Jim Riches was among family members from New York, New Jersey and Connecticut taking a train from Manhattan to Washington on Wednesday to attend the meeting with Holder. Riches said federal investigators "have permission to investigate my cell lines, my family's, whatever they need." He lost his son, Firefighter Jimmy Riches, 29, in the attacks and also was involved in search and recovery efforts at the World Trade Center site, "picking up body parts." "We just want some information, whether these allegations are actually true or not true," said Riches. "We feel we deserve to know." If the allegations are true, the families affected should be notified and those responsible should be held accountable, he said. "Something like this – a terrible loss, losing a son like that – I don't think anybody has the right to pry into our personal lives, unless they're invited in," said Riches. Riches noted that about six months after his son's body was found, the family received calls telling them that more remains had been located. "We wouldn't want something so horrible, for someone else to be listening to that. Nobody should invade that privacy," he said. Asked if the upcoming 10th anniversary of the terror attacks gave added resonance to the meeting, Riches replied that the "pain is coming back for a lot of the families." But while the anniversary is refocusing the attention of "the whole nation and the whole world," Riches said, "we live 9/11 every day. My son is never going to walk through the door. There will never be any closure."